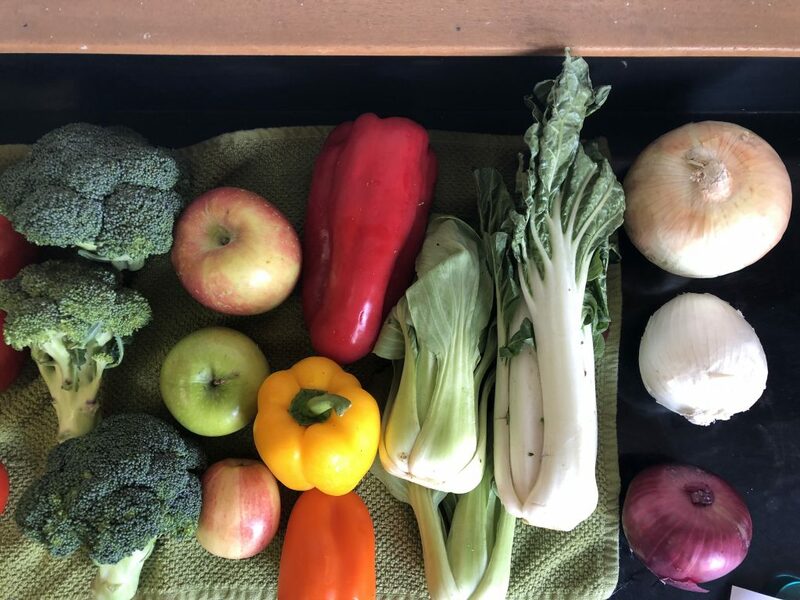 From digging through trash to looking inside of people’s refrigerators, Laura researches household-level food waste in the United States with a focus on measurement and behavior. In addition to examining the questions of “what?” and “how much?,” her doctoral research also explores why people discard food in households. Using both qualitative and quantitative methods, Laura seeks to understand how social and cultural factors as well as the larger food system play into how food is discarded. Drawing from environmental science, sociology, urban planning, and nutrition, Laura combines open-ended interviewing with statistical modeling and direct measurement to understand the larger social phenomena that results in approximately 40% of edible food being wasted in the U.S. Additionally, Laura explores how the concept of “edibility” impacts what we define as food waste and how we reduce it. 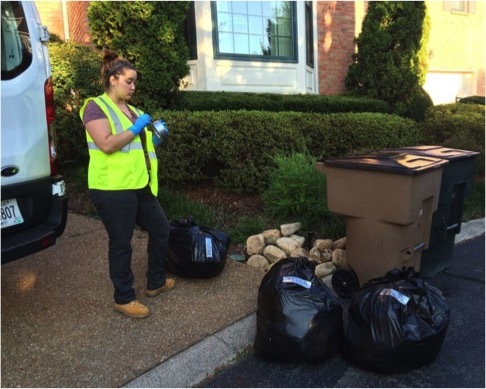 Laura has almost a decade of experience working on waste – ranging from prevention to diversion. Laura has collaborated with the Natural Resources Defense Council (NRDC), Oregon Department of Environmental Quality, and other local governments on projects ranging from the first citywide household food waste measurement study in the United States to an interview study with urban and rural householders to understand their relationships with food and waste. Ultimately, Laura hopes to continue to contribute to preventing the amount of wasted food globally through applied research, designing interventions, and public education. Prior to her PhD, Laura worked at the U.S. EPA on renewable energy and sustainable materials management with a focus on organic materials. She earned her B.S. degree from UC Berkeley in Conservation and Resource Studies with a concentration in Environmental Education and her M.A. in Energy and Resources from UC Berkeley. In her free time (or to relax), Laura loves gardening, cooking, and crafting. Watch Laura’s video and learn more about her research and experience at ERG below. What have you been working on that most excites you? Many reports and papers have been published documenting the extent of the “food waste problem.” It is estimated that around 40% of the edible food in the United States never gets eaten, with a large portion of that (~40%) generated by households. However, what excites me the most is trying to answer the question “What explains why people waste food?” Most of us feel guilty or do not want to waste food, but we still do. Many people know why wasting food is not desirable, but still discard a fair amount of food that could’ve been eaten. If guilt and knowledge are not changing behavior, then what can? To help answer the “why” question, I not only get to explore how and why people throw away food at any given moment, but also how people relate to food, how food fits into daily routines, and how food is supplied to us. I get to sit down in people’s homes and talk to them about food. I get to sort through their trash. What is both the most exciting and the most challenging part of my work is that there is not one answer to why people waste food, in fact, the “answer” is complex and different for different people in different contexts. For instance, some of my research explores the concept of “edibility.” Specifically, it looks at how edibility is perceived and how the concept impacts food waste measurement and messaging. While most people would agree that an egg shell is inedible (note that egg shells are used by some people as food), would most people agree that a broccoli stalk is inedible? Potato skins? Apple core? The diversity of opinions is astonishing. And, how assumptions of edibility are included in measurement and research is often not transparent. While this might seem different, this is also part of the “why” question. How does the perception of edibility influence how much food we discard and why we waste it? And, how does the definition of edibility influence how we frame the problem? What difference has researching at ERG made for you? I was primarily trained in the natural sciences before coming to ERG. ERG has allowed (and encouraged) me to explore other disciplines, specifically sociology, nutrition, and urban planning, which greatly influence my work. I now look at wasted food from a completely different mindset than I did before. I no longer view wasting food as a socially deviant behavior but as a socially inevitable one. People waste food as a result of social and structural processes that impact everyday life, thus we must understand and influence those process to create change. The great thing about ERG is that it allows me to work with a wide range of people with different expertise and perspectives, including both academics and practitioners. As a result, I believe that my research will be more well-rounded and impactful. Within ERG, I have collaborated with Isha Ray and Duncan Callaway to help guide my work. Isha has been instrumental in helping me apply social science research methods and sociological theories to my work while Duncan helped me refine my methodology. Additionally, I have been working with professors and researchers outside of ERG to guide my research. This includes Alastair Iles and Matthew Potts in Environmental Science Policy and Management (ESPM) at Cal, Wendi Gosliner at UCANR, and many other researchers globally. While at ERG, I have also worked with the Natural Resources Defense Council (NRDC), City of Seattle, Alameda County Waste Management Authority, and EPA. Why did you choose ERG? I chose ERG, because the work that I do doesn’t fit neatly into a specific discipline. I believed that researching food waste prevention would best be done from an interdisciplinary perspective. By being in ERG, I get the “keys to the castle” in a lot of respects. I can take classes in any department and work with a wide range of researchers. Plus, the people are ERG are truly amazing. I have never met a more supportive group of people. I have had a love for food since as long as I can remember. 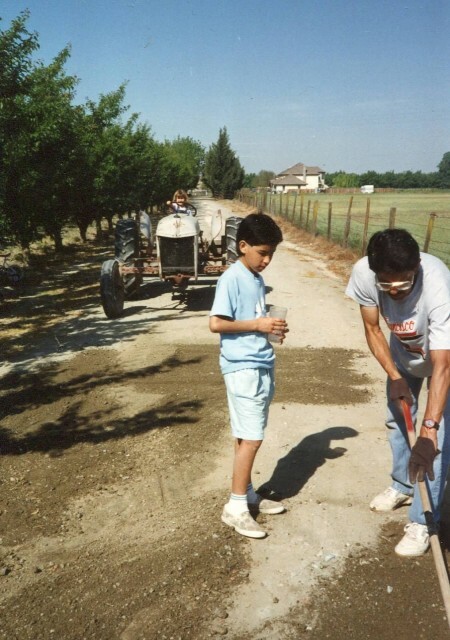 I grew up for the first part of my childhood on a ranch in the Central Valley of California. I have fond memories of eating plums off the ground (because the ones that just fell off the tree were the sweetest and tastiest) and of the first time I ever saw a chicken slaughtered. I feel very fortunate to be one of the increasingly smaller number of people that have experienced the growing and preparing of food first hand. This has not only inspired my desire to decrease the amount of food wasted, but also made me appreciate the human labor and natural capital that goes into making the food I now buy in a grocery store. It also made me realize that not all food is perfect and beautiful, but that doesn’t make it any less valuable! We need to embrace those imperfect looking fruits and veggies! Graduate school and ERG is a lot of work, but it is worth it if you are doing something that you truly enjoy. Also, start grad school with an open mind. Every day I am more and more aware of how much I don’t know. Spotlight updated on September 4, 2018 by C. Hyun.